Featured Projects of Iowa Questers. This fund is at the heart of our Quester mission. Grants are awarded in odd numbered years opposite International Quester grant years. Chapters apply for funds for a specific local restoration or preservation task. Each application is carefully reviewed to be sure that it meets the guidelines. The guidelines that the committee uses when evaluating the grants are very strict and in agreement with the International Guidelines. The committee includes the immediate past three state presidents. At State Day, the grant checks are awarded. All chapters that receive a grant have one year to complete the project and report back to the Committee with proof of completion. Funds come from individual and chapter contributions, proceeds from the Ways and Means Committee, one half of the overage from Area Days and State Day, and $1.50 from each member's dues. Grants totaling $19,741.70 were awarded at the 2017 State Day. Visit the museum website www.museums.iastate.edu/BAM.html or call 515-294-3342 for exceptions to the regular schedule as the museum may be closed under some circumstances. In 1996, the Iowa Quester State Council voted to approve an ongoing state project - the development of the Iowa Quester Glass Collection. Joining in partnership with Iowa State University Museums in Ames, Iowa, our focus is on building a world-class permanent glass collection, presenting major glass exhibitions, and providing supportive educational programs for Questers and the general public. Since its humble beginning of seven glass objects donated in the first year, the collection has grown to hundreds of glass examples of various forms and manufacture. Housed in the Brunnier Art Museum, University Museums on the campus of Iowa State University, the collection is supported by monetary donations for acquisitions and education as well as glass objects donated by individuals and Quester Chapters. Exhibits and corresponding seminars that have occurred to date: The Golden Age of Art Glass (1999); The Brilliant Period of American Cut Glass (2003), The Evolution of American Pressed Glass: 1825-1925 ( 2008); and Novelities is the Norm in Early American Pattern Glass (2013). Our newest exhibit it titled Sophisticated Simplicity, Selections from the Iowa Quester Collection. It includes the pieces of Pleat and Panel, original manufacture names Derby. In 2000, Iowa Questers raised funds to purchase the collection's signature glass object (pictured left), a Brilliant Period monumental cut glass vase in Empress Pattern manufactured by Quaker City Glass Company, Philadelphia, circa 1905. 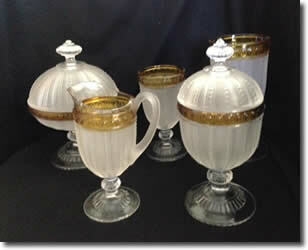 The Iowa Quester Glass Committee has been fortunate to receive several large collections in the past few years. We now have over 1,100 items in our collection. Starting in January 2010 and continuing for 5 years Iowa Questers glass will be featured in one or both glass cases at the museum entrance. Chautauqua Circuit #889, of Mason City presented this lovely Rubina pickle caster to the Iowa Quester Glass Collection at the 2015 State Day in honor of their member being installed as the new Iowa President. Iowa Questers have supported many projects at Terrace Hill the Governor’s Mansion. A recent project that Questers contributed to was towards the restoration of the 1928 swimming pool that was installed on the grounds while Grover Hubbell occupied Terrace Hill. $1,170 was given by Questers to repair and install the three historic art glass light fixtures in the pool house. Questers volunteer in many ways and assist in decorating the main floor for the holiday season. The Quester Christmas Tree with antique ornaments, surrounded by late 1800's toys is perfectly fitting in the family parlor. Recently a vintage feather tree was purchased and is decorated and displayed during the Holiday Season. Iowa Questers have been generous with their time, talent and contribution to Terrace Hill. There are two opportunities to support the Terrace Hill Funds. 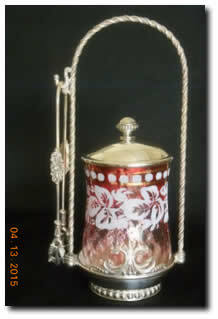 You may designate your gift to the Pre-1900 Ornament Fund or the General Restoration Fund. Iowa Questers recognize Iowa's youth through a 4H Preservation and Restoration Award annually at the Iowa State Fair. Three awards are presented, each receiving a medallion and certificate of recognition. Each award winner may designate a museum or historical society to receive a monetary gift in his/her name. The first place award is a $200 donation, second place is $150 and third place winners earn $100 donations in their name. Criteria for the award are that the participant's project will follow the requirements of 4H and the Iowa State Fair. It must be a restored item, it must include a written report telling the history of the item and the steps and process used to restore it. Pictures of the restoration should be a part of the report. Judging will be by the quality of workmanship in preserving and restoring the item and the written report accompanying it. There are many 4H classes where our Questers Award fits. Historical/Family Heritage Class, wood refinishing and photography are examples. 4H judges pick top projects and the Quester Award will be chosen from that group. The Awards are presented during the Iowa State Fair. Recent projects have included the restoration of The 1st Iowa Regiment Co. B Flag from the Civil War, selected rare examples of Early American Pressed Glass for the Iowa Questers Glass Collection at the Brunnier Art Museum and acquiring examples for the Textile Collection at Iowa State University, ranging from handmade feed sack clothing to a Halston designer evening gown. 2016 was a special year for Iowa Questers. We turned 50 and we hosted in International Quester Convention that year. A rare historical Gonterman table set was purchased for the Iowa Glass Collection in recognition of these two events. 2015-2017 President Carol Tinkey chose a project to honor and memorialize Iowa’s Music Man, Meredith Willson. Donations were used to purchase a granite bird bath and sundial to replace the original ones that sat on the Willson family marker in the Elmwood – St. Joseph Cemetery in Mason City. The beautiful and rare complete table set with celery vase (pictured) has been purchased with funds from this Presidents’ project. The pattern is Duncan No. 95 as the original manufacturer’s name but more commonly known as Gonterman. It was manufactured by George Duncan’s Sons, c. 1887-1890 in Pittsburgh, PA. 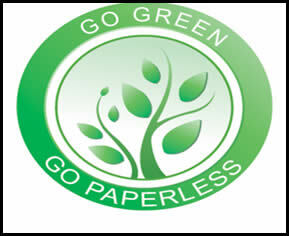 Going Green emphasis during this President’s term implemented practices within the organization’s administration to reduce expenses. With the further development of this website, Quester forms and informational material that formerly were printed and mailed to all chapters bi-annually were made available for Iowa Questers by accessing the members’ only portion of the website. One of four state board meetings each year was held online to lower mileage expense. This, in combination with mailing and printing costs greatly reduced, and allowed more funds to support the State Grant program and established State Projects. Begun in 2009, these cost saving practices continue to be effective today. Roy Halston Frowick was born in Des Moines, Iowa, in 1932. In the 1950s he launched his dressmaking career. Opening his own salon in 1968, Halston became one of the most acclaimed designers of the 1970s. His designs were classically simple, elegant, and chic. 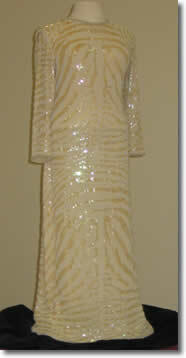 Iowa Questers purchased this 1970 hand beaded Halston evening gown that had only been worn once in a fashion show for the Clothing and Textile Museum at Iowa State University in Ames, Iowa. This 1880’s compote in the Frosted Ribbon pattern with a Rebecca at the Well stem was manufactured by Bakewell Pears & Company. It was the first item selected for acquisition and preservation of Early American Pressed Glass. 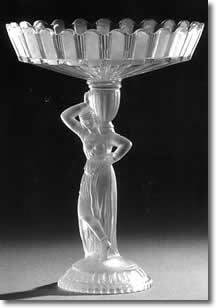 Iowa Questers raised funds for this and other rare examples of early American pressed glass for the development of the Iowa Questers glass collection. In 2008, Iowa Questers in conjunction with the Brunnier Art Museum at Iowa State University hosted an exhibit “The Evolution of American Pressed Glass - 100 years, 1820-1920. 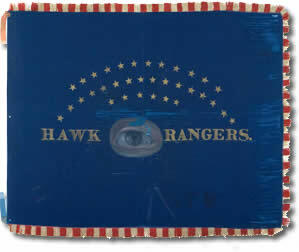 The silk Civil War battle flag of the Hawkeye Rangers, Company B, 1st Iowa Volunteer Cavalry, has an unusual painted eye and was made by the women in Lyons (what is known as Clinton today). It measures 29x42-inches and the flag is part of the State Historical Society’s Iowa Battle Flags Project. A hawk, 34 stars, and words “We will meet you at the Border” are on the back. Iowa Questers raised funds for the flag restoration in addition to an International Questers preservation and restoration grant that was received by two Iowa Chapters, Captain Greeley #871 of Ames and Artifacts and Old Lace #524 of Des Moines. The cost for the complete restoration of the Hawkeye Banner flag was over $10,000. We accept contributions for these funds in the form of donations and gifts. All contributions should be in the form of a check made out to Questers of Iowa and clearly marked with a notation for the fund. Iowa Questers is a 501c3 organization and tax deductions are allowed to the limit specified by the tax code. Please contact us for more information.